Bells have been part of society for the past 2,500 years. Found in ancient China as early as 500 B.C., they appeared in France by 550 A.D., and a hundred years later in England. In Colonial America they were used to summon worshipers to religious services as well as to warn of approaching danger. Bells have also been used to announce a curfew, to mourn the dead, and to celebrate a joyous event such as a wedding or holiday or military victory. They come in all sizes and shapes, and are made of a variety of materials. Generally the ones we think of are vessel shaped, made of metal, and are sounded by striking the rim or edge manually or electronically. Some bells tended to swing with a clapper making the tone by striking the metal wall. More recently large groups of bells tend to be stationery and the clapper, not the bell motion, creates the sound. In general the modern bell, regardless of size, tends to be four parts copper and one part tin, and is designed in a tulip shape. Ten bells were cast by the McShane Bell Foundry of Baltimore for St. Michael's as were the 10 bells at St. James Church. 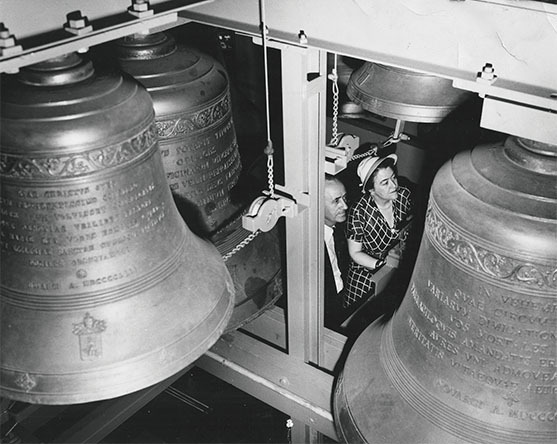 The mixture of bells was different at St. John's on Mulberry Street. They are the first in Newark, and were installed in 1858. Edward Wien, the sacristan was in charge of bell ringing. St. Aloysius Church on Bowery Street had nine bells, as well as the 'city's steepest belfry.' St. Mary's Abbey on High Street had four bells which were the responsibility of Brother Anthony, and they were 'hung in the old German order.' Recently, according to Father Augustine Curley of Newark Abbey, one of the original bells was dedicated to an early and somewhat obscure German saint, St. Liborius. However, the oldest bell comes from the original St. Mary's Church which was burned and sacked in an anti-church riot by Newark's Know Nothing Party in 1854. The Italian Church of St. Philip Neri in the Ironbound was watched over by Fr. Brown where Brother Augustus 'rings the angelus by pulling one stroke on the heavy bells which itself rings the other stroke in recoil Repeating this twice gives the three peals of these, that is the usual call of the angelus.' The Sunday Call felt that Newark was greatly indebted to the Roman Catholic Church for all these wonderful bells. In the Ironbound, the tallest steeple belongs to St. Casimir's Polish Roman Catholic Church whose bells were installed in 1920. According to John Dwiboroczyn, parishioner and lifelong area resident, the bells were named for the church's patron saint, St. Casimir; for St. Stanislaus, Poland's patron saint; for Our Lady of Cyestochawa, the Black Madonna; and for St. Joseph. They have been rung daily at noon and at 6 p.m. for the past 78 years. Most of the great old Protestant churches along Broad Street had steeples, and many of them one exceptionally fine bells or, later, some sort of electronic chimes. The large bell at Grace Episcopal has 'a deep rich tone, weighs 2,500 pounds, and rings out in the musical note of ‘E.’' It still sounds today at the beginning of Sunday morning mass and on other important church occasions and national holidays. The ancient bell at Old First Church has been known to Newarkers for 200 years as well as that at Trinity/St. Philip's Cathedral in the northern end of Military Park. At the north end of Broad Street, across from the Broad Street railroad station, the Episcopal House of Prayer installed a new bell on Easter Day 1870 weighing 2,000 pounds, bought with money raised by Sunday school children. In May 1875 a newer bell replaced the earlier one which cracked only after a few years of use. Any large city would be pleased to boast of such a wonderful collection of bells and chimes. Indeed, few could surpass Newark in that claim. But there is more. Installed in the Cathedral Basilica of the Sacred Heart, the nation's fifth largest church, is a magnificent set of 14 bronze bells cast by Diciano Colbachini e Figli (Colbachini and Sons) of Padua, Italy, a firm that has been marking bells since 1745. Sacred Heart's bells are stationary and struck by a hammer played from an electronically operated keyboard. Originally installed in 1953, they eventually became inoperable. A decade ago, after David Fedor, became organist and director of music at the cathedral, the system was replaced and the bells became part of the cathedral's and community's life again, sounding the angelus at noon, and announcing each Mass. Each bell has its unique sound and its own name. What an experience it is to walk up the front sidewalk to the cathedral as the great bells are beginning to ring. Why, it's almost like the sky overhead has opened up, and heaven is singing to the passerby.